Only showing entries about fries from Sustainable Travel. View entries about fries from all Travellerspoint blogs. Low impact Building/style of living. Location : Stekene, Belgium. Carl's hard work. His Hamadryad. When we went on the HelpX website checking out what kind of hosts were out there in Belgium, we definitely were shocked to find out there were only 4 (this was in spring 2010). Luckily one of those four was exactly what we were looking for. A low impact building project in Flanders. After having been backpacking throughout Europe for about 11 months we planned on ending our adventure where it had started. A lovely tiny little country named Belgium, my country of origin. I bet I know what you’re thinking right now… Mmm Belgian chocolates and waffles. Well yes, I won’t deny that we do have those tasty things. But what we are more proud of is our Belgian fries and especially our Belgian beer. Let me give you all just one little tip. If you go to my country, go to one of the many old traditional style pubs and ask the person serving you which local beers he or she would recommend. You’ll have a wonderful beer experience, that I can promise you. If you are interested in finding out even more, I can highly recommend downloading his brochure that is if dutch is one of your languages though. Browsing his website will give you a good idea too. The part we were able to help out with, was constructing the wooden skeleton of the house. We didn’t use any mechanical machines that would cause harm to his land, which created a very interesting, mathematically challenging and sometimes dangerous work environment. Don’t worry, we weren’t harmed in any way except for numerous mosquito bites. Carl made sure, he was the only one involved in risky business. When we first arrived there was only one beam up. The foundation and the chimney, which would be the central point that would carry all the weight, was already in place. Our accommodation was in a trailer on the property and Connor helped finished building an outdoor kitchen. Collectively decided so there would be less fries shop visiting and more home cooking. Eventually towards the end of our stay, Carl’s girlfriend moved in along with her chickens and cats and it all started to look even better! A perfect picture. 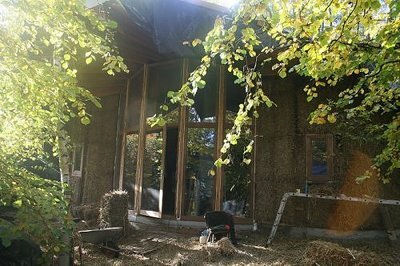 The next stage, which we unfortunately weren’t around for, would be putting in straw bales as walls and finished off with cob rendering. 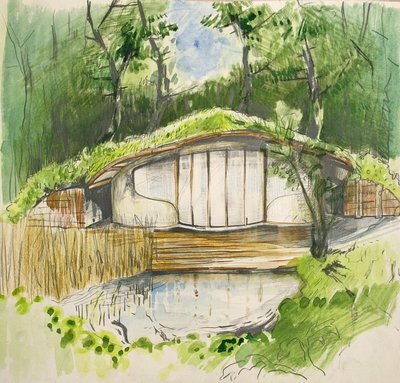 Next to a green roof and even an underground ice cellar, there’s so much more to this low impact project. Carl’s project is a beauty and I sincerely hope everything works out as it is supposed to. Next time we will pass through my home country again, one thing that’s definitely on the list is to go visit and talk about all that has been going on over a couple of delicious Belgian beers.